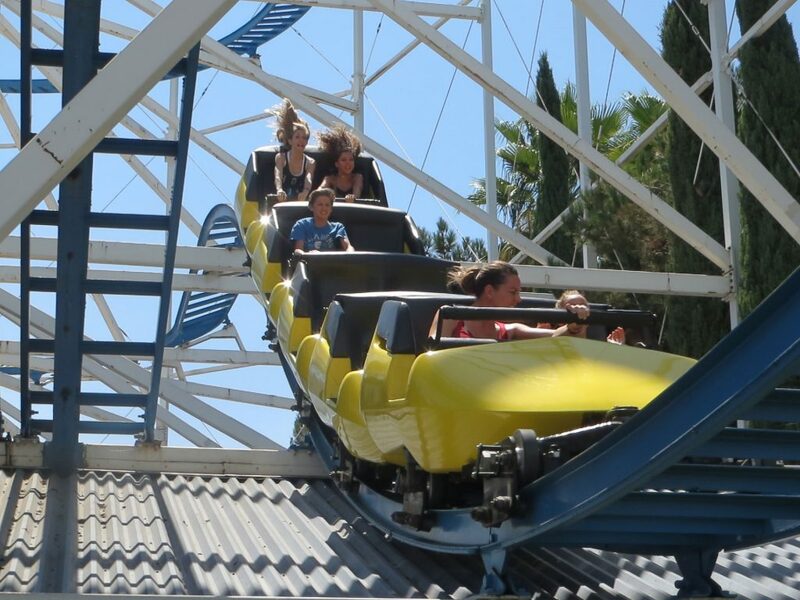 Screamer at Scandia Amusement Park in California, USA. E&F Miler was founded in the late 1940’s in Portland, Oregon, USA, by Carl Miler under the name of “Miler Manufacturing”. 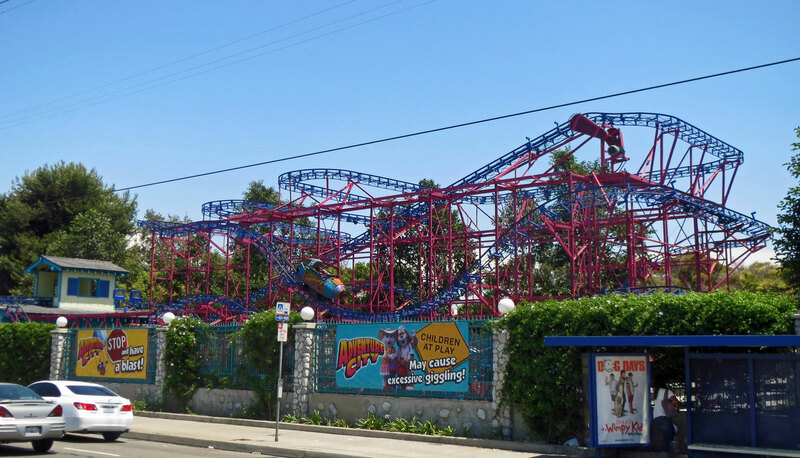 Miler Manufacturing specialized in family and Wild Mouse roller coasters which were built exclusively in the USA between the 1940’s and 70’s, after which the company ceased building new coasters. Miler Manufacturing was reopened in 1989 by Carl’s son, Fred Miler. 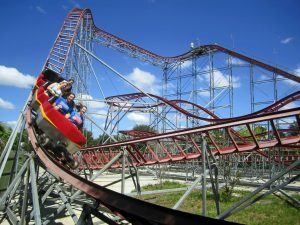 The first coaster to be built under Fred’s watch was The Great Pumpkin Coaster at Kings Island in Ohio, USA, in 1992, which coincided with another company name change to “Miler Coaster, Inc.”. The company changed its name to E&F Miler Industries in 2013 when Fred’s son, Eric, joined the board. Carl Miller died in 2001. E&F Miler Family Coasters are most suitable for riders under 42 inches (1m) in height, although adults can ride. The ride type is typically an oval shape, perhaps with an indentation, and a couple of small bunny hop hills. The height of the coaster is relatively short making them an ideal first coaster for young children. Viking Voyage at Wild Adventures in Georgia, USA. An E&F Miler Hi-Miler is large oval footprint coaster with multiple tiers. The lift hill stretches up and across almost one entire long side of the oval. At the top of the lift hill, the track makes a 180 degree turn, heads down a small drop and then up towards another 180 degree turnaround. After each turnaround, the track becomes lower through the tiers before it ends at the station. Hi Milers come in three sizes; 38 ft, 52 ft and 88 ft (11.5m, 15.8m and 26.8m). The first Hi Miller to open was Screamer at Scandia Amusement Park in California, USA in 1992. 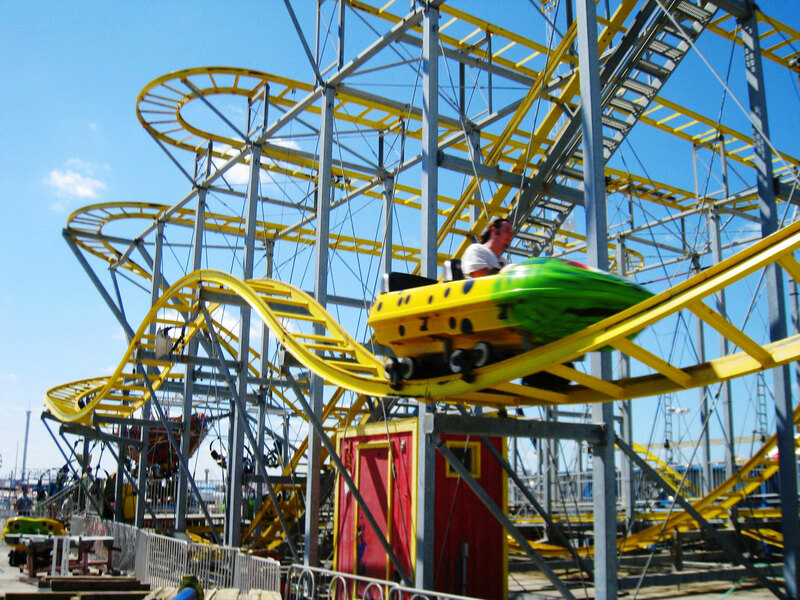 In 2012 a Hi-Miler, Star Jet at the Casino Pier on the Jersey Shore, was sent into the Atlantic Ocean when Hurricane Sandy caused a section of the pier to collapse. 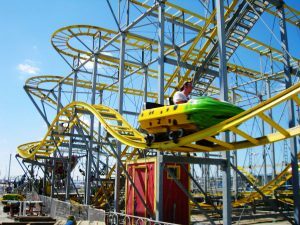 Wild Mouse at Casino Pier in New Jersey, USA. Like their Intamin and Mack Rides counterparts, the Chance Rides Hyper-lite is essentially a miniature version of the Hyper Coaster. Standing roughly 100 feet (30.5m) tall with a top speed of 55 mph (88.5 km/h) and lots of hills and twists, the Hyper-lite offers an abundance of ejector airtime. 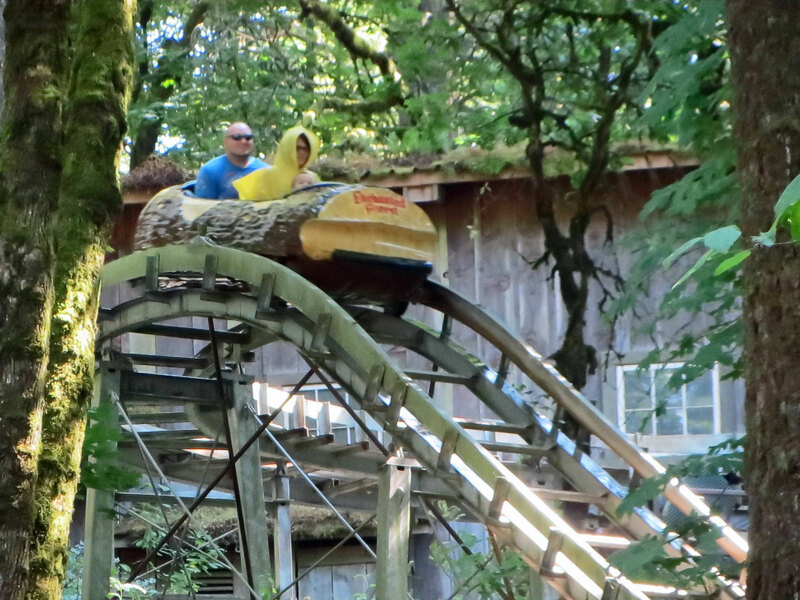 Tree Top Racers at Adventure City in California, USA. 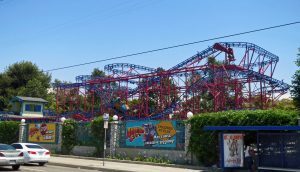 Miler Manufacturing created their Mighty Mouse wild mouse coasters in the 1950s and are similar to a traditional wild mouse with a smaller footprint and a narrow car with column seating. 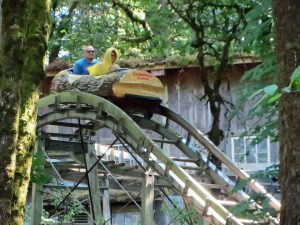 Big Timber Log Ride at Enchanted Forest in Oregon, USA. A roller coaster with a water splash, similar to what you would find on a log flume. So much so that many riders might think it is one. This was the world’s first Water Coaster when it opened in 1996 at Enchanted Forest in Oregon, USA. 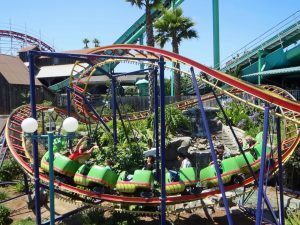 Sea Serpent at Santa Cruz Beach Boardwalk in California, USA. 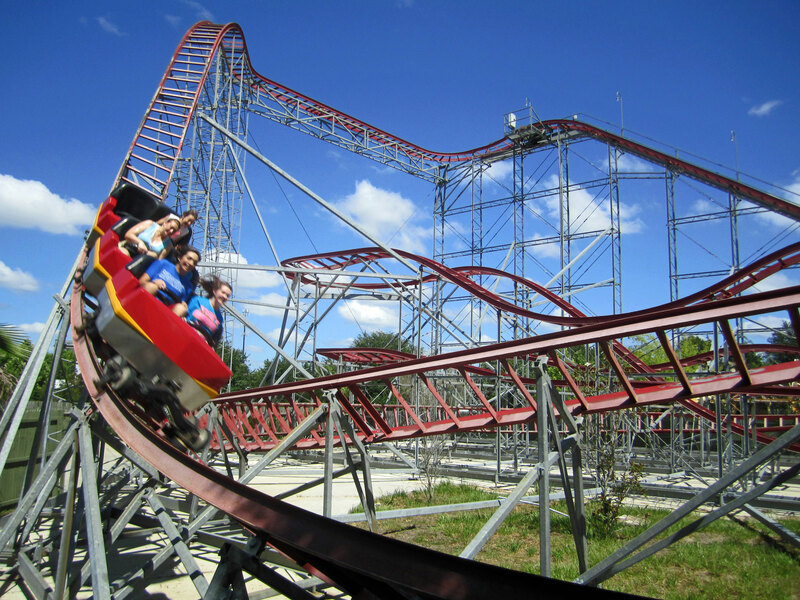 Aside from creating new roller coasters, E&F Miler Industries renovate coasters created during the Miler Manufacturing era.